The annual Food Bikes Festival saw more than 200 guests gather in Madrid’s trendy Melia Princesa 5* Hotel for an exclusive gourmet reception. The venue was held inside the unique Sabatini Lounge of the Melia Princesa 5* Hotel and provided a focal point for gastronomy, business, and healthy living gurus. The event attracted renowned figures in the world of gastronomy, art, media and sport including former Real Madrid basketball legend and 1984 Olympic Silver Medal holder Fernando Romay as well as actor Juanma Navas, Onda Cero´s radio journalist Jaime Novo, Mrs Ana Rosa Alonso from The Royal Gastronomy Academy along with reputed sommeliers, representatives from El Corte Inglés, Westin Palace, Villamagna and Wellington Hotels and other industry influencers. 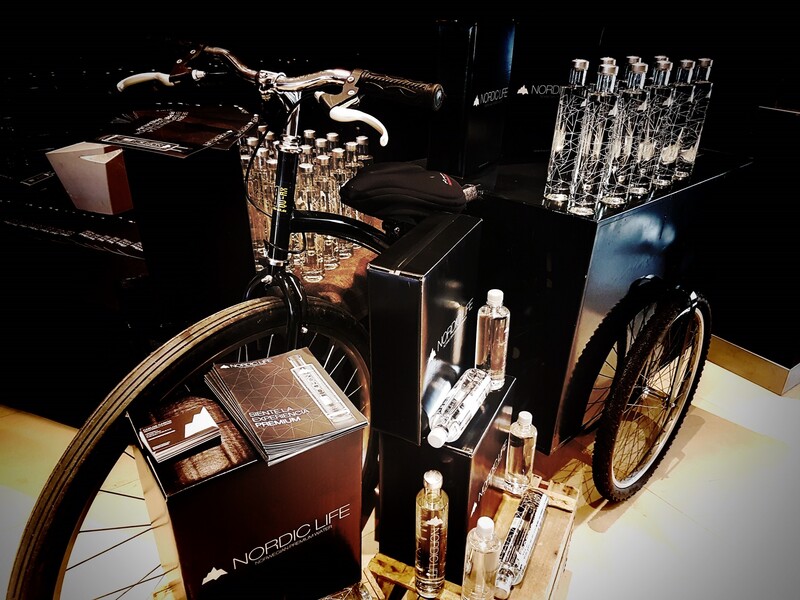 The centrepiece of the evening was a themed counter that paid homage to our Norwegian natural water and showed off the innovative design of the Nordic Life Premium Glass bottle. A cosy corner for guests to grab a selfie and enjoy the exclusive opportunity to taste Nordic Life water themselves. Nordic Life delighted the assembled guests with a Pure Natural Water Experience that highly impressed representatives from “El Corral de la Morería” (1 Michelin Star holders) and “El Bohío”, the most famous restaurant of Chef Pepe Rodriguez (Master Chef TV presenter). Nordic Life was the only non-alcoholic beverage represented at the festival and was exhibited alongside other exclusive products from across the country. Guests were treated to tasty snacks provided by exhibitors who didn’t hesitate to showcase their delicious pistachios, truffle marmalades, premium wines as well as a live show cooking experience with delicious eco-beef. Elsewhere, the attendees witnessed demonstrations on how to understand sustainable olive oil production along with an inside look at the secrets of delicious homemade chocolate. We all enjoyed of an incredible evening with the best company in a unique and exclusive setting. Nordic Life will continue surprising you with upcoming events so stay tuned to discover the next venue. Alessandra Ambrosio, International Top Model, is invited to the presentation of the Nordic Life event next October 26th in Madrid. Want more information? Suscribe and get all the last news related with the event. We can use this information to contact you with related info and offers.